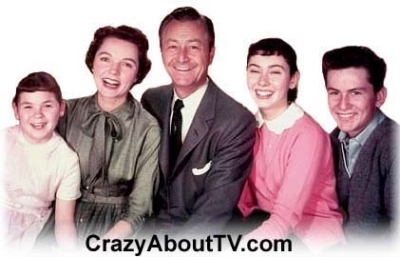 The Father Knows Best TV show was a 30 minute family comedy series with moments of drama that aired on CBS. It was about the inter-personal relationships between loving parents and their children. Each and every episode had a wholesome message such as "What's more important ... career or family?" ... or ... "How to allow your children to choose their own path in life even if you don't approve". The parents made mistakes as all parents do and so did the kids, but by the end of each episode, love prevailed and their family was secure. Robert Young .......... James "Jim" Anderson Sr.
Billy Gray ............ James "Bud" Anderson Jr.
Before the TV show, there was a Father Knows Best radio show that aired from August 25, 1949 through November 19, 1953! Robert Young was the only cast member to make the transition from radio to television. The series was so popular that repeats continued to be shown in primetime for three years after production ended and during the daytime for another 5 years after that! The public couldn't believe that the show was ending as it was still #6 in the ratings at the time. The main reason given was that the main premise of the show was a father guiding his children towards adulthood. Well, Betty and Bud were pretty much grown up. Another reason given was that after 6 years of the same series, many of those involved were "losing their creative juices". They wanted to go out on top rather than let the show deteriorate. Robert Young has a Star on the Hollywood Walk of Fame (Approximately 100 feet west of Mann's Chinese Theater). Most programs at the time were filmed with 3 cameras in front of a live audience. Father Knows Best used only one camera and no audience. Some well-known guest stars on the TV show included Cornell Wilde, Barbara Eden, Robert Reed (Dad on "The Brady Bunch), John McIntire (Wagon Train), and John Daly (The Moderator of the "What's My Line" quiz show). Unfortunately, 13 episodes can not be found. "Stagecoach to Yuma" (#40) and "Not His Type" (#202) were original episodes. The other 11 were "flashback" shows. The distributors decided that "flashbacks" would not work well in syndication and apparently disposed of them. In 1959, the U.S. Treasury department paid to have a 30 minute Father Knows Best episode produced. It was circulated to schools, churches and other groups for the purpose of selling savings bonds. It never aired on tv. The title was "24 Hours in Tyrantland". Jim Anderson was the manager of "General Insurance Company". "Waiting, for love to find us, is something worth waiting for. Someday, my arms will hold you, my lips will kiss you, forever more. Yes, waiting, can be so lonely, yet somehow we'll see it through. Knowing, there's someone waiting right there just for you". two seasons. This accounts for why some episode titles are listed twice. Thank you for visiting our Father Knows Best page!